Does Diabetes Cause Varicose Veins? All the veins in our bodies are responsible for carrying blood back to the heart. However, as humans age, these veins tend to decrease in their functionality and they no longer control blood flow as they should. This is especially prominent in the veins on our legs, giving rise to varicose veins. Normally, blood flows smoothly through healthy veins all the way to the heart. This flow to the heart normally occurs in a single direction, preventing the blood from flowing backward. When the veins stop working properly, the blood can no longer be stopped from flowing backward, causing the veins to be swollen or enlarged. This weakening of the veins is caused by a number of factors, such as age, being overweight, being female, being pregnant, and prolonged periods of standing. Some people think that diabetes is one of the biggest causes of varicose veins. Is it really? Is there a link between diabetes and varicose veins? Diabetes is a condition in which the body is no longer able to produce or utilize insulin properly. Insulin is very important to the body so it can properly process sugars and carbohydrates. Without insulin, your body can no longer regulate blood sugar levels properly. Type 1 Diabetes. An autoimmune disorder that usually begins at a young age. This occurs when the insulin-producing beta cells are destroyed by the body’s own immune system. This affects the body’s ability to produce insulin. Type 2 Diabetes. It is the most common type of diabetes as it occurs in 90-95% of all diabetes cases. This occurs when the body does not produce enough insulin and/or the body’s cells become resistant to insulin. 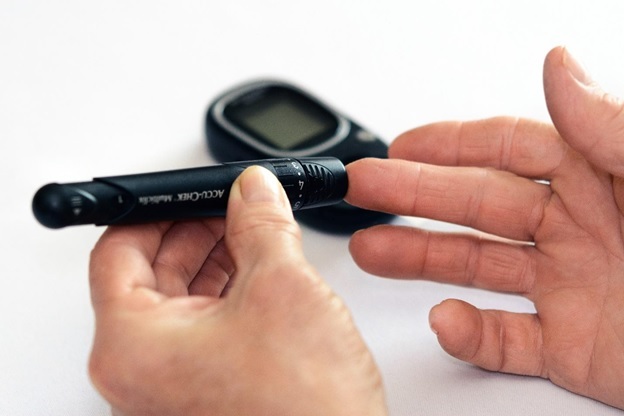 In both types of diabetes, the person is required to take insulin in order to survive. When these conditions are kept unchecked or when healthy habits are not maintained, a variety of health conditions can be developed, which include blindness, kidney disease, loss of sensation in the feet and toes, stroke, heart attack, and gangrene, which could also lead to infection and amputation. Are Diabetes And Varicose Veins Interrelated? Aside from the numerous health conditions that can arise when diabetes is left untreated and unchecked, it can also cause the walls of your veins to weaken, which makes it more likely for varicose to develop. In spite of the apparent connection between diabetes and varicose veins, it does not cause the condition directly. This correlation between the two conditions arise due to the similarities in their risk factors as both conditions can be an effect of old age, pregnancy, obesity, and having a family history or genetic predisposition to develop either diabetes or varicose veins. But while there is no causation between diabetes and varicose veins, there are still instances when varicose veins occur on diabetes patients. This gives rise to plenty of other complications. Varicose veins are very common when you get older. In many cases, varicose veins on their own are no cause for concern as they only appear to be unsightly, oversized veins in your legs. There might be instances wherein the veins might be too painful, in which case you should have it checked out. But in most cases, varicose veins do not appear to be life-threatening. However, a combination of diabetes and varicose veins can be quite deadly. That is why individuals with diabetes (both types) should always look out for signs of varicose veins and should act with an increased sense of urgency as having both diseases can aggravate each other, resulting in even greater, more life-threatening complications for the patient – having varicose veins might exacerbate the symptoms and effects of diabetes, and vice versa. As stated above, diabetes can strongly affect blood circulation due to elevated sugar levels in your bloodstream, damaging veins, and valves in the process. On the other hand, in the case of varicose veins, the veins are enlarged due to the weakening of these veins. Having blood with elevated sugar levels pass through veins that are already weak, especially having them stay for too long, can lead to very serious conditions such as ruptured veins, edema, ulcers, nerve and kidney damage, and in worse cases, a stroke. Additionally, having a high concentration of sugar in your bloodstream can make it difficult for wounds to heal. This can make surgery a non-option when it comes to the treatment of varicose veins for diabetes patients. Diabetes patients already face an incredible amount of risk because of their condition. When this condition is coupled with varicose veins, this results in an incredibly delicate situation. That is why patients with diabetes should always look out for any venous irregularities. Always inspect your legs and feet regularly for any warning signs of varicose veins. Surgery is often a non-option for diabetics because patients normally have problems healing. That is why most specialists turn to non-surgical, non-invasive methods for varicose vein treatment. These include – but not limited to – endovenous laser ablation (EVLA), ultrasound-guided sclerotherapy (UGS), phlebectomy. These procedures are considered more viable because they are out-patient procedures and are done without any surgery, no anesthesia, and do not require hospital admission. ● Taking an active role in taking care of yourself and following your general practitioner’s recommendations. ● Taking excellent care of your own skin, especially the legs, by moisturizing at least two times every day. Chicago Vein Care Center with 2 offices in Chicago and Niles, specialize in the diagnosis and treatment of varicose veins. Dr. Ramon Castro is a diplomat of the American Board of Venous and Lymphatic Medicine. We offer you a free consultation with Dr. Castro that also includes a free ultrasound. Please call 773 283 7887 to schedule a free consultation.